Even though watches can be made using a variety of materials, special features and price points, there are several parts common to most watches created for both men and women. More specifically, there is little deviation from the basic parts used to make a watch's face, a watch's most prominent and important feature. 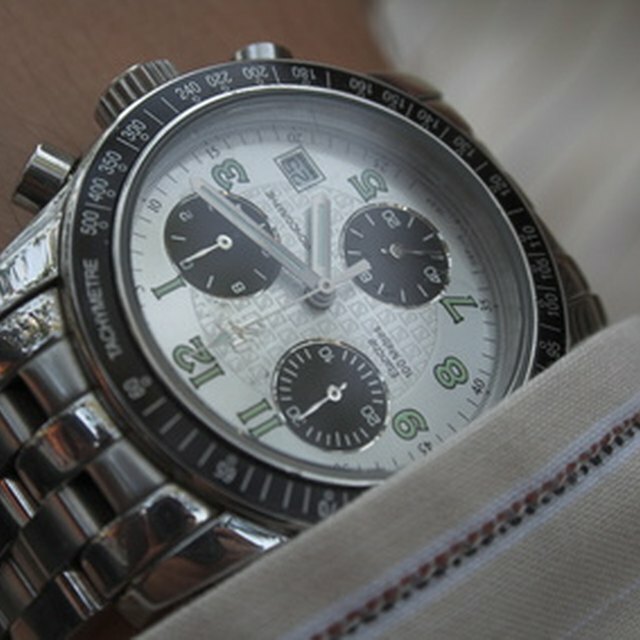 A watch's face may convey not only the time but the date and even location of its owner. The dial of a watch is its main display where the time markings are written. The hands of a watch are attached to the middle of the dial, rotating clockwise around the dial in the appropriate hour, minute and second intervals. A watch's dial may also display the calendar date and other extra information, such as a compass or company insignia, depending upon its style and brand. The crystal component of a watch face is the clear protective covering directly over and surrounding the dial. Although the crystal can be made from synthetic sapphire crystals, many watch crystals are created with plastic or other cost-effective compounds similar to the clarity of glass. Smudging and small scratches to a watch's crystal won't necessarily mean the watch itself is ruined, but keeping the crystal free from damage and corrosive liquids will help increase the aesthetic longevity of the watch. The hands of the watch point to the corresponding hour and minute of the day. Some watches include a third hand which moves by the second, making the instrument useful for tasks where seconds matter in measurement. These moving hands are short, thin strips are made from materials like plastic and metal, with the latter found in more expensive watches. Generally, the longest hand will point to the minute, the shortest the hour and the thinnest will denote the second. The markings on a watch's face denote the numbers used to represent the time of the day. These numbers can either be written using a standard 1 to 12 scale or Roman numerals on an analog watch. No matter how large or small they are, number markings on a watch face should always be written starting with 12 at the top center of the face and go from 1 through 11 clockwise around the face. The crown of the watch is the small metal knob used to adjust the hands of the watch to reflect the accurate time of day. It may be attached on either side of a watch's face and can be twisted both clockwise and counterclockwise, depending on how the time needs to be adjusted. The crown can be a fragile part of a watch's face, so avoid pushing, pulling or twisting it too roughly.